Made up of over 300 pages, IKEA has just released their 2018 catalogue in Australia and it doesn’t disappoint! They are globally renowned as experts in delivering current design trends and style at affordable prices. Granted, IKEA is not for everybody but as they plan to take the warehouse shopping experience online, it will certainly become more accessible to those who may not be brave enough to shop in store. We love the considered approach the global retailer / manufacturer has taken to design and collaboration. Together with their team of expert designers and engineers, names like Tom Dixon are teaming up with IKEA to deliver customisable, flexible and affordable pieces that will make a statement in anyone’s home. Weather you are in the need of some stylish storage solutions, a revamped office space or just some general ‘zooshing’ IKEA has it covered...and the great news is that it wont break the bank. Here are our top 5 faves and why we love them. NUMBER ONE. This cabinet offers the perfect balance of practicality in it’s shelving, whilst the rattan delicately keeps the mess at bay. The brass-like handles provide the slightest touch of luxury and textural contrast to the main body of the frame. NUMBER TWO. As inner city living tends to get smaller, we need to be smarter in the way we use our space, especially for home offices. Floor place is precious, so keeping furniture off the floor and on the wall can work wonders for giving the illusion of more space. This wall-mounted combination can be designed to suit your requirements, but the balance of powder coated steel and bamboo materials is a really natural looking solution to work with. NUMBER THREE. Storage boxes are such a practical thing, but why not make the box as beautiful as possible on the outside?! This printed paperboard box is finished with a design and colour combo not to dissimilar to jesmonite- heavily on trend as a stone finish. The black powder-coasted steel corners finish it off perfectly too. I think I’d be much happier filing things away if my storage boxes looked like this. — Marcus Engman, Head of Design at IKEA of Sweden. NUMBER FOUR. IKEA are launching a few new ranges later this year, and this is one to be excited about. 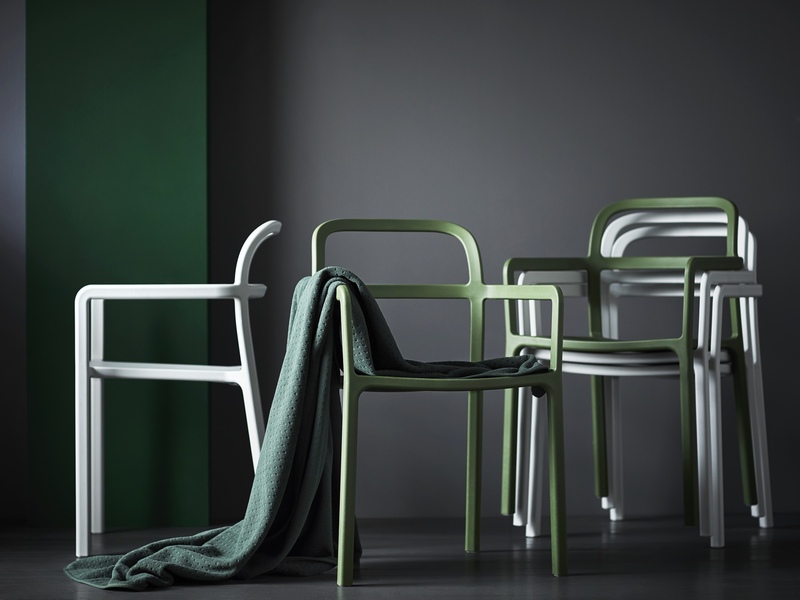 Together with Swedish design house ‘HAY’, they have collaborated to develop a range of products that are basic in design, adapting to modern needs and showcase a beautiful selection of materials and colours. This YPPERLIG Monobloc chair has been made from one piece of plastic, coated with UV finish so suitable for both indoor and outdoor use. They say its form is strong enough to be used in both public and private spaces and its lightweight structure allows it to stack well. NUMBER FIVE. Seen for the first time at the Milan Multiplex show this year, the DELAKTIG won’t be available fir us to buy until 2018. 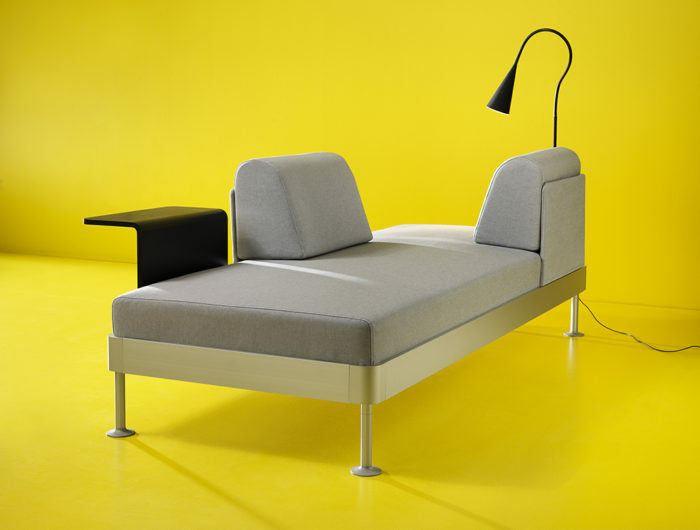 This bed turned sofa is the ultimate transformer of all beds. As an initial concept from British Designer, Tom Dixon it is no surprise that this piece is the ultimate and official ‘IKEA Hack’. With design additions available including sofa arms, back rests, side table, reading light and upholstery options, this piece can be adapted to whatever purpose you need it for in your space.